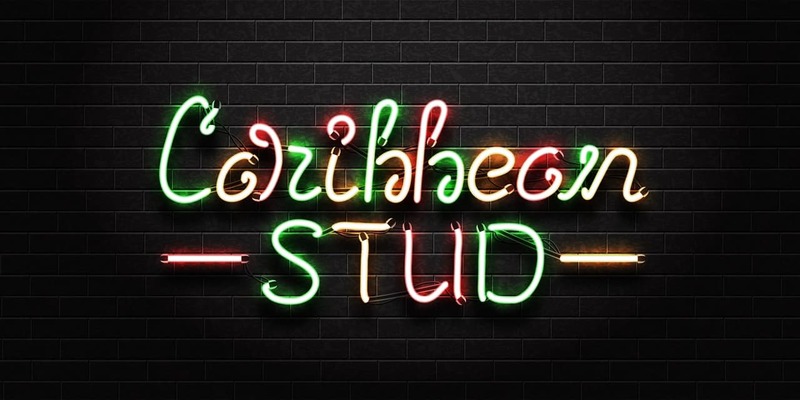 Caribbean Stud Poker is an extremely popular casino-based poker variant that is solely played against the dealer with a standard deck of 52 cards. The game is popular because it is rather simple to play in comparison to other poker games available on the casino floor. It is played using only five cards, has only two main betting boxes, uses the same hand values as other Hold’em games and almost always has a progressive jackpot that is significant in payout. Unlike other poker games, Caribbean stud poker does not allow the player to draw, improve one’s hand or even bluff. However, it does have the same betting structure as other poker games with regards to wagers (antes) and calls. In terms of the overall objective, just have a better hand than the dealer after the betting rounds. How Do You Play and What are the Payouts? Just like other poker games, you begin by placing down an ante which is a beginning bet that must be placed in order for cards to be dealt. At this time, if you are playing at a table with a progressive jackpot, you may place an additional side wager, normally of $1.00. Once bets have been placed, five cards are dealt face-down to the player and four face-down to the dealer with the fifth being dealt face-up. You now must make a decision based on the information you know. You can choose to fold and forfeit the ante and any side wagers you made, or you can place an additional bet if you believe that your hand is of greater value than the dealers. Unlike other poker games, you do not get to choose how much you bet, instead, it is double the ante amount. If you double your ante amount, the dealer’s hand will then be revealed. Now one of two things will happen; if your hand is better then his hand must qualify in order for you to get the payout. If his hand does not qualify, it gets folded and you earn an “even” payout on the original ante wager. This is known as a push. Now, if the dealer’s hand qualifies by having either an Ace or a King, then it is compared to yours and the payout is determined by traditional Hold’em card combinations. The ante will be returned at a 1:1 ratio, however, you will get paid out for the additional bet. The payouts are as follows: a pair is a 1:1, two pair is a 2:1, three-of-a-kind is 3:1, straight is 4:1, flush is 5:1, full-house is 7:1, four-of-a-kind is 20:1, straight flush is 50:1 and royal flush is 100:1. In addition to this, if you win you will get paid out the progressive jackpot according to the casino’s rules, which vary from casino to casino. Although Caribbean Stud Poker has only been in Canadian casinos since the 80’s, it is extremely popular both with dealers on the casino floor and as a live online option through Evolution Gaming. Online gambling is legal in Canada through major licensed casino operators, which is what has allowed online live Caribbean Stud Poker to become such a big hit with Canadian players. You can find this game live on Royal Vegas, 888 casino and others. Anyone who is of legal age can play either on their phone, tablet or computer and have access to the progressive jackpots which give you a chance at winning no matter what the dealer’s hand is. Plus, players have the optional side bet with the 5+1 bonus bet which is where the player tries to make the best five card hand by combining their cards with the face up card of the dealer. This side bet has a high payout if one, does not take into account the dealer’s hand and pays out on a three of a kind or better. Make sure you take a look at the payouts and the jackpots on progressive wagers as these will vary from casino to casino and keep in mind that the house has a 5% approximate edge. In addition to this, don’t try to bluff because the dealer isn’t going to fold for you and always raise on pairs, as pairs statistically will beat the dealer’s hand and make sure to read your cards correctly. Too many glances at their cards thinking they have a good hand only to find out that they don’t and they lose. Finally, know when to stop, as the dealer will be dealt a pair or a better hand about 42% of the time.